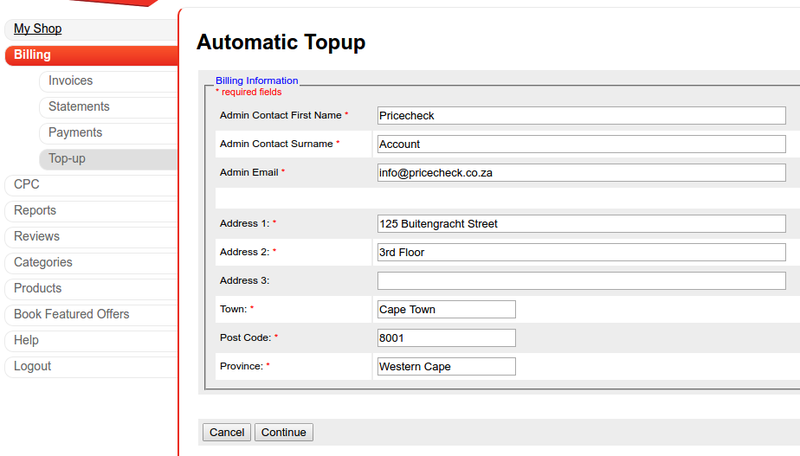 PriceCheck has introduced a new automated monthly top-up function that has been built into your Merchant Dashboard. Why should I choose Automated Top-ups? Auto top-up has been set up in a way that still allows you to stay in control of your monthly budget allocated to PriceCheck but ensures that you maintain a live status during the most important time of the month – after payday. Auto top-up will alleviate the administration of constantly having to manually top-up and most importantly, saves bank costs you would normally incur doing multiple smaller top-ups. Having automatic top up in place also ensures that your store can enjoy uninterrupted exposure and will always be “online” – helping your shop to receive trusted shop status. From the left-hand side menu, select Billing > Top-up. Select or enter an amount to be used for the monthly top-up. This amount will be deducted when the threshold is reached – this is specified in step 4. 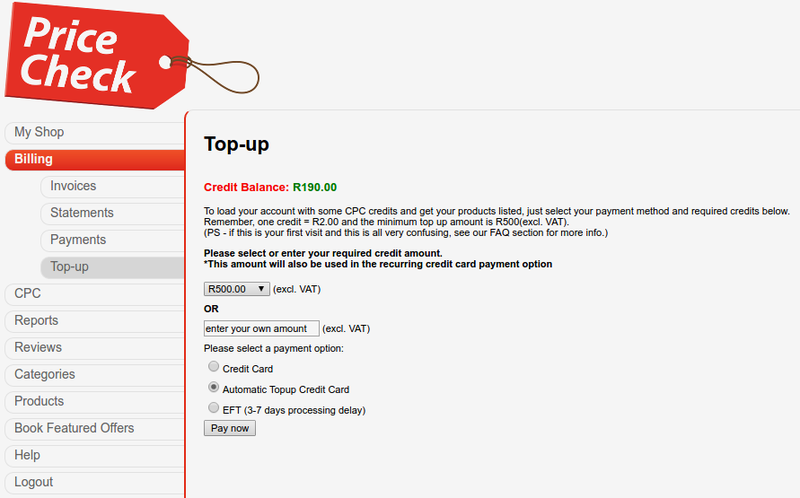 Select the payment option Automatic Top-up Credit Card, and click the Pay now button. A form with all the billing information will be displayed – the *fields are required for us to process the payment. After all the fields are filled in, click Continue to navigate to the payment form, or “cancel”. Configure the automatic top-up and Continue. – Specify the threshold – in this case the threshold is R30, and the account will be topped up when the account reaches 30 credits. – Maximum times of top-up – this is the maximum PriceCheck will perform an automatic top-up on the shop’s behalf. The monthly budget is calculated by multiplying the top-up amount * the maximum top-up times specified. *Note – this excludes the initial payment. – The monthly cycle is from the 20th to the 19th of the next month (not the 1st to the end of the month). Fill out the payment form and wait for a response. If there is an active automatic top-up, there will be a line of text stating the top-up. At the end of the line click on Cancel automatic top-up. Confirm the cancellation of the top-up on the next screen. The top-up is now cancelled, and will not display on the initial top-up screen anymore.